BRISBANE’S property market has become a tale of two cities, with homeowners in the western suburbs revelling in higher home values and a buyer’s market emerging in the south. Brisbane’s west was the best performing capital city region over the past 12 months, with home values rising by 4.8 per cent, according to new data from property researcher CoreLogic. Houses in Fig Tree Pocket jumped in value by more than 10 per cent, while in the less affluent suburb of Moggill, they also rose more than 7 per cent. But on the south side of town, home values declined the most in the past year — falling 1.9 per cent. Units in Yeronga are now almost 5 per cent cheaper than they were a year ago. The change in home values in Brisbane’s east and north is less pronounced, with both regions increasing in value by around 1.2 per cent. With spring selling season just around the corner, the data shows parts of the city are a clear seller’s market, while other parts provide an opportunity for buyers to grab a bargain. Over the 12 months to July 18, home values across Queensland rose 0.7 per cent — made up of a 1.2 per cent rise across the greater Brisbane region, while values across regional Queensland gained 0.2 per cent. CoreLogic senior research analyst Cameron Kusher said the change in home values in Queensland — and within each individual region — in the past year was diverse when compared with the NSW and Victorian markets. “Even looking at Moreton Bay, you’ve got home values in the south of the region climbing 3 per cent whereas they fell a tenth of a per cent in the north,” Mr Kusher said. Unit values in Banksia Beach in Moreton Bay North shot up 15 per cent in 12 months, while units in Griffin in Moreton Bay South fell almost 4 per cent. Even though Brisbane’s west recorded the biggest jump in home values overall, the western suburb of Chelmer saw the largest drop in values of any suburb in greater Brisbane — shedding 9.6 per cent. And while Logan experienced solid growth in home values of nearly 2 per cent in the past year, dwelling values in Ipswich fell half a per cent, despite both being about the same distance from Brisbane’s CBD. “You are definitely finding some disparity between the different regions of the city,” Mr Kusher said. Mr Kusher said it painted a picture of the so-called territorial divide between Brisbane’s north and south. “The south does tend to be a bit more affordable than the northside, so maybe people are looking at the weaker housing conditions and targeting higher value properties in areas where values are a bit higher,” he said. Agent Benjamin Smith of Brisbane Real Estate said he was not surprised home values in the city’s west had increased in the past year, particularly in the suburbs of Fig Tree Pocket and Moggill. “Certainly Fig Tree Pocket has moved up a bit in value, no question,” Mr Smith said. Mr Smith said Fig Tree Pocket had a high retention rate, but there had been plenty of activity among sellers downsizing and upgrading lately. “A very high percentage stay in the suburb and upgrade or downsize,” he said. Mr Smith said he thought Moggill land values had gained at least 10 per cent in the past year, but that was from a low base. “There’s a lot of land development out there, and new houses going up, and that’s helped lift those prices,” he said. Mr Smith said Kenmore was another suburb in Brisbane’s west that was growing in value. “It’s an old area rediscovering itself,” he said. New data from realestate.com.au shows demand for houses in Brisbane’s west has also increased in the past six months, while demand for houses in the south has fallen almost 7 per cent. Views per house listing in the western suburb of Chapel Hill are up a whopping 42 per cent since the beginning of the year. Brisbane couple Pete and Sarah Bradnam bought their home in Bardon, in Brisbane’s inner west, in 2013 and have raised their two children, Harry, 4, and Theo, eight months, there. Mr Bradnam said he had lived in the western suburbs for the past decade — in Paddington, Ashgrove, Auchenflower and now, Bardon. He said the most attractive thing about the western suburbs, particularly Bardon, was the proximity to the city and accessibility to other parts of town. “It is really easy to get to the city from this side of town,” Mr Bradnam said. “It’s close to Paddington’s cafes and Rosalie Village, and it’s also really easy to go north and south. Bardon’s median house price has grown 6.6 per cent in 12 months to hit $948,350. 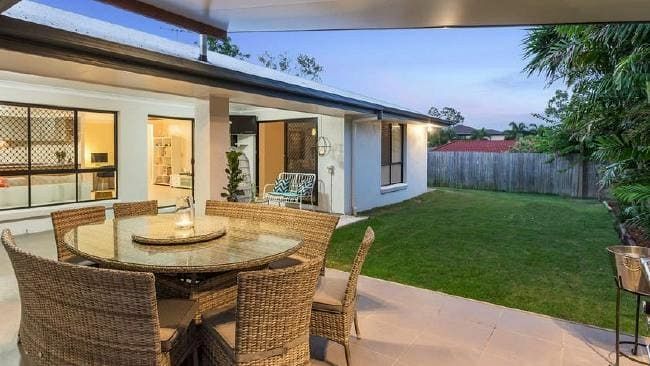 Mr Bradnam, who recently sold a home he renovated in the same suburb, said he believed Brisbane’s west was a safe place to invest in property. “You’re pretty safe in these areas to spend money renovating a house, provided you do it wisely,” he said.